That seems like a LOT of additional people, right? Well, it definitely is, and DC is pretty much off the charts with this giant daytime population increase. Even Boston, the next closest city in our population category, only sees 141% of its nighttime population during the day. 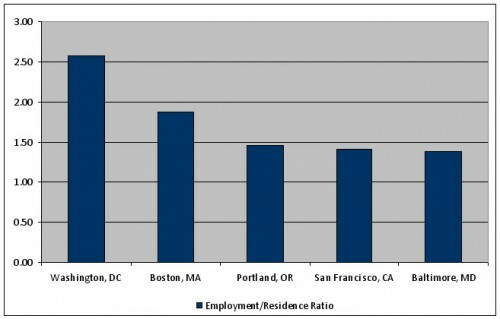 DC’s employment/population ratio is 2.57, meaning that 2.57 times as many people work here as live here (this includes people who live and work in DC). That’s off the charts for any other major American city. So even though the District is just a city of less than 600,000 people, it has to provide services for about a million people during the day. That’s the reasoning behind a commuter tax (which is so politically unpopular it would never happen), or a congestion fee (which has been successful in places like London, but the logistics of setting up such a system in the District are insane)– trying to get some money from those who don’t pay District income taxes, but do use District services. Now that it’s Census time again, it will be interesting to see how these numbers change. I’m sure the District will be at the top of all other cities again, but perhaps by a less staggering gap. DC has really reinvented itself in the past ten years as a place to live– neighborhoods have been revitalized, community facilities have seen additional investment, and downtown is now seen as a safe and attractive community. Many people who want to live closer to their jobs are choosing to live in the District now, whereas ten years ago they’d probably have settled in Arlington instead. There you have it– the rumors are (almost) true! 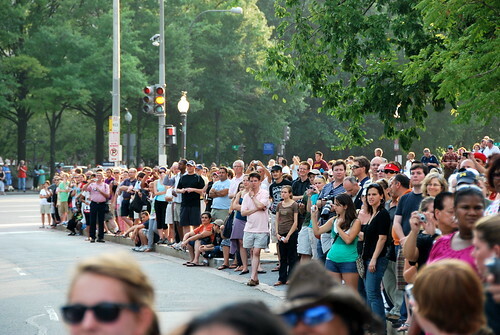 DC’s population increases by a huge margin during the day– though not quite double– and it is out of the realm of any other major American city. In terms of people (rather than percentages), only New York City sees more commuters enter the city during the day. The person you walk by on the sidewalk is just about as likely to live in Arlington or Fairfax or Rockville as the District. What about those of us who do a reverse commute? I work in Bethesda, but live in DC because I love living in the city. Here’s another possible topic — how many people actually reside in the District, including all the people who are legal residents of Virginia, Maryland, Illinois, whatever. I’ve known a number of people who kept their legal residence in their previous location for tax reasons, laziness, etc. Regarding the commuter tax – have other cities implemented such a thing successfully? It really seems to be the only way, and I’m one of the people that would have to pay it. @ Shulan There are thousands more like you, and you’re taken out of the equation by the Census. @WFY Census estimates are how many people live in the city, regardless of citizenship or legal residence. So this should be as accurate as possible. @dcgrrl New York used to have one, and Congress would have to approve one for DC (which would never happen), so I think you’re safe for now! The Census aims to count every resident. Where you are counted for the Census is not the same as where you are registered to vote, where you have your drivers license, etc. It’s merely a measure of where you actually reside most of the time. This is to ensure that the data we have is as accurate as possible, since much of it is used to apportion city and state services. I believe they had (still have?) a commuter tax in Philly. I lived in New Jersey but paid a city wage tax to Philly as a worker bee there, which I could deduct from my New Jersey taxes. @Sassycatz You’re right– it’s taken out of wages directly by employers in Philadelphia. It hasn’t been such a success though, as some blame it for driving businesses out of the city. 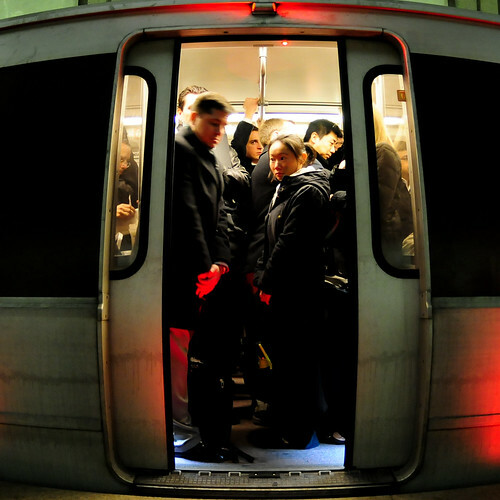 Since a commuter tax is untenable, how about a complainer tax? Every time somebody complains on a blog or radio show about how long the Orange Line took, or how expensive the taxi back home to Arlington was, or how high the parking meter rates are, or how bad the roads/crime/schools in DC seem from the suburbs, they should have to pay a tax. Budget shortfalls would disappear in no time! We don’t have that kind of money. And by we I include you, bucko. I’m just saying, let the bears pay the bear tax. I already pay the Homer tax. @shannon I may be safe from paying a commuter tax, but that doesn’t mean I’m safe on Metro or driving on unkempt DC roads. If Congress is going to keep insisting on running DC, they need to do a better job. Their home states would never let them get away with this crap! I’ve long had the belief that lawmakers shy away from spending money on improvements in the DC area (Metro in particular comes to mind) because they don’t want to make it look to their voters like they’re spending money on ‘themselves’. To put it another way, will a Wyoming senator (for example) find angry people back home because he voted for federal funding to be used on the District, his new home, rather than spending that money in Wyoming?